A Civil Action - The Woburn Toxic Trial > Overarching Questions > Cancer Clusters: Fact or Fiction? 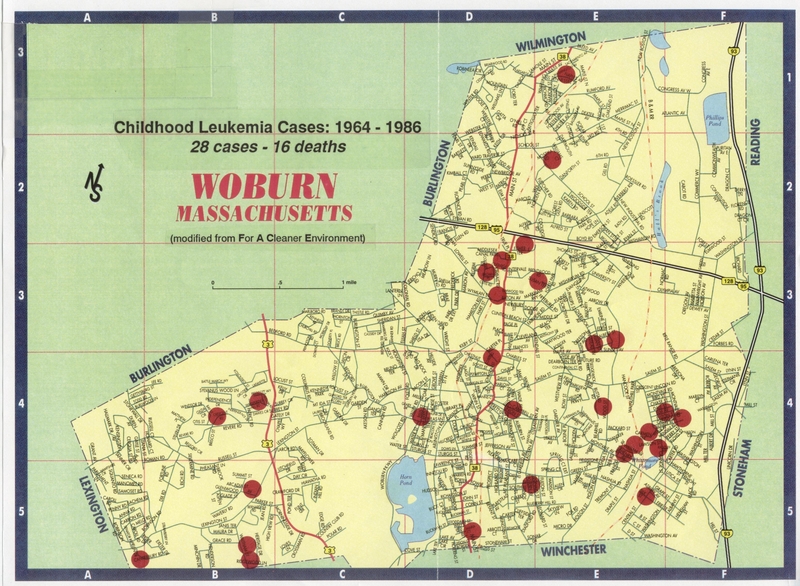 The Woburn trial focused on a suspected childhood leukemia cluster and its connection to toxic pollutants TCE and PCE in the city's municipal water supply. 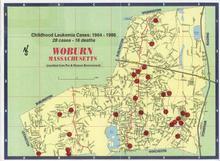 This webpage includes background information on cancer clusters, as defined by Centers for Disease Control, and specific information on cancer clusters related to the Woburn trial. A disease cluster occurs when a greater than expected number of people become ill with the same disease in a given geographic area, a group of people, or a period of time. When this disease is the same form of cancer, it is called a "cancer cluster". The Centers for Disease Control have specific definitions for cancer clusters. Epidemiologists suspect a true cancer cluster when there are a large number of cases of the specific type of cancer, rare cancers or increased cases in a specific age group that was previously unaffected. What Data are Needed to Confirm a Cancer Cluster? To decide if a cancer grouping is a true cluster, an epidemiologist must obtain demographic, geographic, and environmental data that may link cause-and-effect between the cancer victims and external sources. Specific information regarding the Woburn cancer cluster is presented in the January 23, 1981 document entitled Woburn: Cancer Incidence And Environmental Hazards, 1969-1978 prepared by the Massachusetts Department of Health. Current use of computerized data and geographic information systems has greatly reduced the time necessary to identify the occurrence of a cluster and its possible causes. Maintaining these types of databases was not widely done prior to the plaintiffs filing their complaint against W.R. Grace & Co. and Beatrice Foods, Inc. When the first public health report was released regarding the potential Woburn cancer cluster (see Parker and Rosen at State and Federal Health Studies), the experts did not agree that the evidence for defining the cluster was conclusive. Much of the the defendants' trial strategy focused on other possible sources of carcinogens that were part of the families everyday environments. This line of questioning was highlighted in the movie with Robert Duval's character (Jerry Facher) questioning the plaintiffs' expert, John Drobinski, in his deposition and on the witness stand regarding their use of personal hygiene products, consumption of peanut butter, crisp bacon, etc. The plaintiffs put more emphasis on the validity of the medical science that formed the basis of the Massachusetts Health Department report. Their efforts centered on bolstering the validity of the epidemiological studies using statistics. At the time of the trial, experts agreed there were no definitive causes for the types of leukemia. Difficulties in obtaining data. People change residences and it can be difficult for epidemiologists to identify previous exposures and find the records that are needed to determine the kind of cancer a person contracted, or if it was cancer at all. In addition, cancer may take years to develop after exposure to a cancer causing substance. Many reported clusters do not include enough cases for epidemiologists to arrive at any definitive conclusions. Sometimes, even when a suspected cluster has enough cases for study, a greater than expected number of cases (a true statistical excess) cannot be demonstrated. Other times, epidemiologists find a true excess of cases, but they cannot find a causative explanation for it. For example, a suspected carcinogen may cause cancer only under certain circumstances, making its impact difficult to detect. Who Decides if a Cancer Grouping is a Cancer Cluster? State epidemiologists typically decide if a grouping is a cancer cluster. One of the best known cancer clusters emerged in the 1960s and involved mesothelioma (a rare cancer of the lining of the chest and abdomen). Researchers traced the development of mesothelioma to asbestos exposure, which was used in shipbuilding during World War II and was also used in manufacturing industrial and consumer products. For an abstract, see A survey of cancer and occupation in young and middle aged men. I. Cancers of the respiratory tract., Coggon, D., Pannett, B., Osmond, C., Acheson, E.D., British Journal Industrial Medicine, 1986, May, v. 43, n. 5, p. 332-338. Cancer Cluster Information Families against cancer keeps a list of information on suspected cancer clusters.